The Rune-like letters around the outside of this pentacle is said to be a relic from the Atlantean days. These magical letters, called the "Witch's Runes," are thought to be connected to the Cabalistic Enochian Script of the Elizabethan Astrologer and Magician Dr. John Dee. Through "Angelic Communication" the Anges Michael and Uriel gave to John Dee this Magical Alphabet..."divinely inspired and transmitted to humanity by various of God's Angels." Sometimes called the "Theban Alphabet," this script is very popular among the elemental crafters of today. These ancient runes have been used from time immemorial as a Magical Alphabet from which Spells and inscriptions were written. The powers of these Magical Letters are enhanced by the Magical Pentacle. 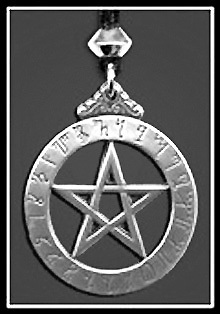 The Pentacle is a Magical five-pointed star formed by one continuous never-ending line. It is an ancient symbol honored by many cultres and carrying many meanings; a symbol of Truth, a sign of Completeness, of Protection, a symbol of Mankind and is closely associated with the Earth and the Earth Mother Goddess. Comes with a black satin cord.